Peperonata is an easy and delicious dish made with yellow, green and red bell peppers and onions. Thanks to its versatility and sweetness, you can either eat it alone, or use it as an ingredient for other meals, as a sauce for a pasta, as a side dish, cooking it in the oven with a roasted chicken and even put it in a burger. You can make it and freeze it in small portions and reuse later during the months, which is something i actually do for all the year along. This recipe is fully vegan, there’s no really need to put anything but olive oil, onions and peperoni in the pot, and some tomato sauce. (And if you like it a little sour like me, also a little wine or vinegar). If you like it sweet you can use red onions, otherwise you can use white or yellow ones. I’d rater use red not to put any sugar into it and later correct the sweetness with some white wine and vinegar. I totally LOVE sweet-sour taste. Sautè one clove of garlic in olive oil for 5-10 minutes, at very low heat. Meanwhile, slice the onions of 1/4 of an inch and add them to the pot. Cook for 15 minutes, or until the onions becomes soft and translucent. While the onions cook, clean the belly pepper by removing all the seeds and the white membrane inside. Slice them around an inch. Add the belly peppers to the pot, mix them with the onion and sautè with a glass of white wine, then cook for 10 minutes, until the alcohol from the wine evaporates. Then add hot tomato sauce and cook for 20-50 minutes depending from the size of the belly pepper slices. At the end you should have a sauce with the bell pepper still in big chunks and the onion stripes (some of them broken in pieces). Adjust of salt and pepper and cook for just another 5 minutes, until it reaches the consistence you want. I personally like to let it cool down ad put it in the fridge for a night before eventually warming it up and consuming, to allow all the tastes to blend in a beautiful way, but you can also consume it right now, in a pasta, or with a slice of toasted bread. Again, try it with sausages (the sweet and sour taste is perfect with them) or even with a burger. Or even better plain, as a side dish. 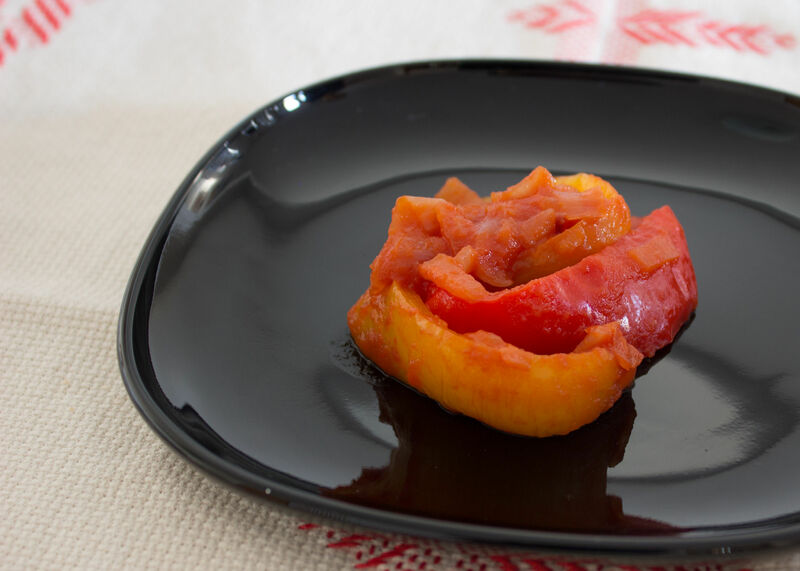 You can freeze the peperonata in containers in small portions, and reuse them later. 7. Cook until the peperoni are soft but still firm.